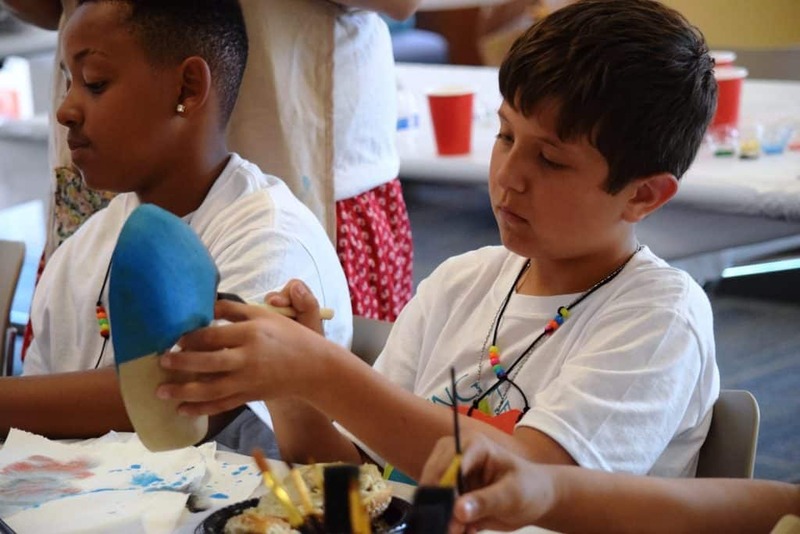 Children and their families at last year’s Camp Healing Hearts participated in structured activities, including paintings masks to illustrate how they really feel while putting on brave faces for those around them. Family Hospice offers this free one-day bereavement camp for children ages six to 12 and their parents/guardians who have experienced the death of a loved one. Registration is now open for this year, with Camp Healing Hearts scheduled for June 30 at Carlow University. Family Hospice and Palliative Care welcomes grieving children and their family members to participate in Camp Healing Hearts, a free one-day bereavement camp. Camp Healing Hearts will be held Saturday, June 30 at Carlow University, 3333 Fifth Ave., Pittsburgh. Pre-registration is required. As a community partner, Family Hospice and Palliative Care offers this free camp for children ages six to 12 and their parents/guardians who have experienced the death of a loved one (such as a parent, sibling, grandparent, other family member, or friend). Camp Healing Hearts gives a safe and supportive environment for children and families to express feelings, remember a loved one, develop coping skills and create bonds and friendships with others who have experienced a similar loss. Camp Healing Hearts is staffed by licensed professionals from Family Hospice and trained volunteers. Camp Healing Hearts will take place from 9:30 a.m. to 3:30 p.m. and includes a continental breakfast and lunch. Throughout the day, children will participate in structured activities, including art, memory boxes, movement, music and pet therapy, as they remember their loved ones and learn healthy ways to grieve. Family Hospice and Palliative Care welcomes grieving children and their family members to participate in Camp Healing Hearts, a free one-day bereavement camp. Camp Healing Hearts will be held Sat., June 17 at Carlow University, 3333 Fifth Ave., Pittsburgh. Pre-registration is required. WHO: Family Hospice and Palliative Care and Zacharia & Brown, Elder Law Attorneys. Family Hospice is Western Pennsylvania’s leading, nonprofit hospice provider. Serving the community since 1980, Family Hospice provides compassionate end-of-life care to 3,600 patients annually in nine Western Pennsylvania counties. Zacharia & Brown is one of the oldest elder law firms in Western Pennsylvania. Zacharia & Brown focuses on assisting seniors and their families with various legal and financial issues, including life care planning, asset protection and Medicaid and veterans benefits eligibility. WHAT: Free Health Care Decision Making seminar. Attendees will have the opportunity to speak directly with experts, who will offer advice and answer questions about living wills, health care power of attorney, health care advance directives and more. WHEN: Wednesday, April 16, 2014, 6:30 – 8 p.m.
April 16 is National Health Care Decisions Day. HOW: RSVP by April 14; call 412-572-8747 and leave your name and phone number. For more information, contact Christine Meduho, 412-398-1395 or cmeduho@familyhospice.com. MORE: Dr. Hughes and Ms. Brown will be available to personally assist attendees in completing their health care advance directives. Family Hospice and Palliative Care President and CEO Barbara Ivanko, MSW, will conduct a seven-week course on “Mindfulness Based Stress Reduction” (MSBR), February 11 through April 1, at Family Hospice’s education center, 50 Moffett St., in Mt. Lebanon. Based on the acclaimed program developed at the University of Massachusetts Medical Center, these sessions are designed to teach participants how to reduce stress and anxiety, enhance good health and improve coping techniques. The best candidates for MBSR are motivated to take better care of themselves and draw upon their inner strengths for greater ease of living. Sessions will take place Tuesday evenings, 6:30-8:30 and include one half-day retreat on March 22. The $350 registration fee covers all sessions, the half-day retreat and related materials. All fees support the nonprofit mission of Family Hospice and Palliative Care. Space is limited. Please email memili@familyhospice.com to register. For more information, visit www.FamilyHospice.com.